I caught myself sneaking food today. I’m an adult and act like one (most of the time, some of the time) so I can eat whatever I damn well want! I’m not on a diet, I don’t have health restrictions, and I don’t snack on junk food during the day. I don’t drink sodas (takes too much room otherwise reserved for wine), I don’t eat sweets (although an Oatmeal cookie would be REAL good right now. I weigh exactly what I did the day I graduated from high school and I exercise regularly. So why would I need to sneak food from my own pantry? Kali gets her two healthy meals a day and always gets her’s before I get mine. In the morning I feed her as soon as we get up and during the afternoon/evening she gets her dinner well in advance of when Holly and I sit down for our meal. 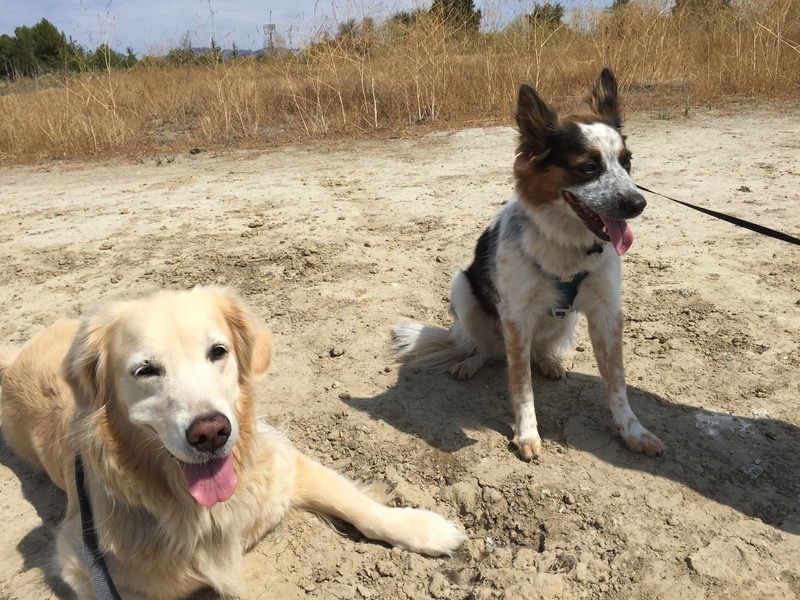 She gets a healthy dose of treats on our walks and good behavior is reinforced throughout the day for following the rules, and for being so darn golden. Yes, it’s a “dog’s life” alright! Yet today I caught myself sneaking food. I didn’t want Kali to see me because I feel guilty when her big brown eyes lock onto to the food I have following it all the way up and into my mouth. Anything in a package or box will tip her off that food is in play and she comes running. Kali is highly food motivated (understatement of the millennium ) which on one hand has made her very trainable but on the other hand can sometimes be a pain in the palate. So today I snuck food. I had been working in my office all afternoon and needed a quick snack. I come down downstairs and see Kali sleeping at the foot of the stairs. I walk by her like I’m walking through a graveyard full of sleeping zombies. I make my way to the pantry and fridge and need to make a quick decision about what to grab for a snack. The refrigerator door opening is like a siren that will surely wake sleeping flesh-eating zombies and I could be doomed. Too risky! OK then, the pantry. Perfect. I see some almonds in handful portions right in front of me. I love almonds even when they don’t have all the yummy salt stuff you usually get at the bar. While high in caloric content they are also high in protein and work good to fill you up. A healthy and calorically economical snack that can bridge the rest of the afternoon in my office to wine time on the patio a few hours later. There’s one problem. The almonds are packaged in little crunchy plastic bags that make a lot of noise when you open them. I have to be very careful or the Zombies will hear the crunching of the packaging or at the least feel the vibrations rippling through the kitchen. So with surgical-like precision I select a bag and ever so gingerly place it in my pocket. I’m thinking that once I get back up stairs I may need to hide in my closet, open the bag there, and eat the almonds so the flesh-eating Zombie named Kali won’t be woken up from out of the sleeping dead trance induced by the long walk in the very warm sun earlier in the day. So, a stand off. Me, a pack of almonds, and a Zombie dog. I realize if there is one Zombie in the house there may be more. 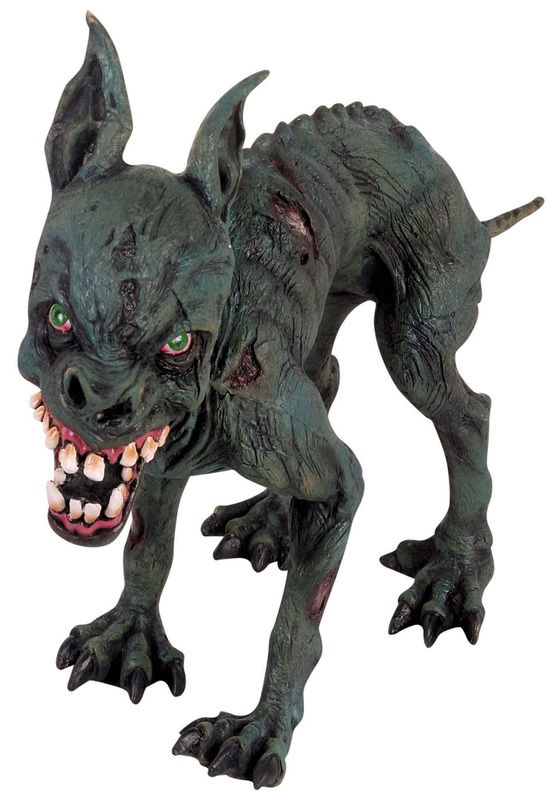 So even if I have delusions of getting past the Zombie Kali there are likely several more – maybe hundreds – upstairs hiding in my closet or worse, under the bed. Yikes! This situation now called for some quick thinking. Yes, this is why humans are superior. Because we can rationalize, theorize, and plan. I quickly realized I have none of those qualities so I resort to another human quality: panic. Panic can be a great motivator. Kali takes the Kong from my hand and slithers off to the foot of the stairs, drooling, and licking. I should make her go back to the kitchen where there is no carpet so the drool is less of an issue. I’m dumb but I’m not stupid and I’m not gonna push my luck with a Zombie. I carefully walk by Zombie Kali, head up stairs, and hope she has somehow called off the other walking dead that are surely hidden in the closet and ceiling of my office. I very gently open the pack of almonds, chew quietly, and thank God I have lived to fight (sneak food!!) another day. The neighborhood was all a twitter as the engines rolled in with sirens and hoses. One after another the engines kept coming and more and more firemen hit the trail. You know you live in a quiet neighborhood when the biggest event in recent history is five or six fire vehicles pulling onto your street to douse a small fire. But, it could have been a much larger fire – lord knows the elements are prime for a huge blaze – but our guys took care of business quickly and efficiently. The trail head to Kali’s creek trail begins at the end of the block. After over a year of walking the trail almost daily Kali knows the trail like the back of her paw. Pretty much the same sights, same smells, and same neighbors out for strolls with the dogs, a bike ride or a jog. Hit the trail head, stop for a quick poop (Kali not me), wrap around the golf course, bark -if antagonized – at a couple yap-yap dogs through a fence in a trailside home, on to the duck pond, a quick jaunt past the dog park (past being the operative term here since Kali is not ready to go in yet), and then we head home. It’s our routine. So it was of some personal interest to Kali and I when we heard the fire engines and saw that they were converging at the trail head from both sides of the creek to address a fire that had started in the brush. One of the fire fighters told me that the fire had been started by someone throwing a flare into the creek. I hate to assume it was kids who did it but boredom in suburbia after two months of summer vacation is the likely circumstance for someone to “see what would happen”. We’re in the middle of a mini-heat wave and the temps were in the low 100’s yesterday and will remain so for another couple of days. So on top of an already drought-ridden landscape the high temps and moderate winds make anywhere in this area prime for a major fire with little effort on mother nature’s part of any one stupid enough to throw a burning cigarette – of flare – into a wooded area. 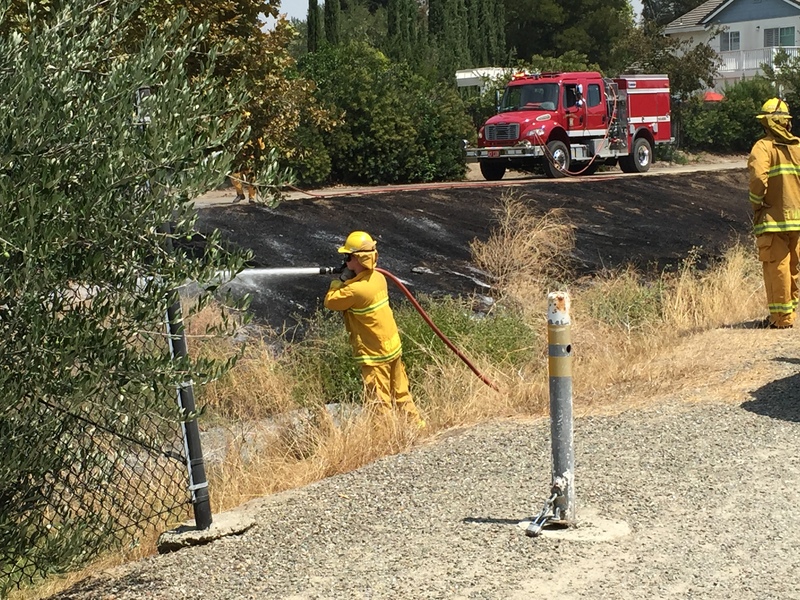 Fortunately, the fire was put out quickly with minimal impact to the creek and no harm to any of the surrounding homes. 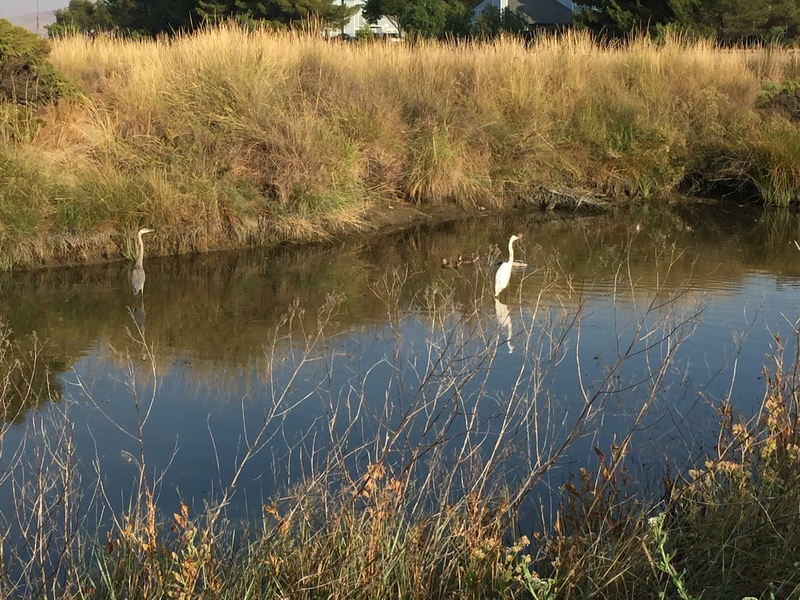 I guess this is one way to get the water level back up in the creek…. I have few if any regrets in my life but not being a fire fighter may be one. And if I had been I guess I’d be adopting Dalmatians instead of Golden Retrievers, right? NOT! I can guarantee you that If I was a fire fighter my Golden Kali would be riding and smiling along side of me in Engine No. 7 and helping to keep her community safe. It’s not the greatest pond in the world. It’s not even the greatest pond in town. But it is our adopted pond; our “Duck Pond”. It’s come to represent the special time Kali and I have, usually early in the morning, when the air is cool and the ducks are still sleeping in their nests (until Kali arrives and gives a woof or two). It reminds me of how fortunate we are to live in an area that is safe, prosperous, and pretty. But mostly it reminds of how often I didn’t stop to appreciate our neighborhood creek and ponds until Kali got here last year and we began our morning ritual of walking and “smelling the roses”. So this morning I took this “pano” shot shot with my iPhone that provides a 180 degree perspective (what did we do before our phones only made calls?!?) that captures the usual turn-around point of our early morning treks, our walks, and our bonding time; me and my Golden Kali. Although the two week sleep-over came to and end yesterday Kali has pretty much been sleeping since Piper left. It was great having Pipes ‘O Peace” hang out with us for the past two weeks. Kali had a lot of fun and was far more active than she usually is. Kali proved to us, as we knew in our hearts, that she can be a great companion and housemate for any dog given a little time to realize that dog is not a threat but actually a friend. As the days passed Piper became increasingly confident and comfortable in her new temporary surroundings taking lots of time to explore the house and yard on her own. 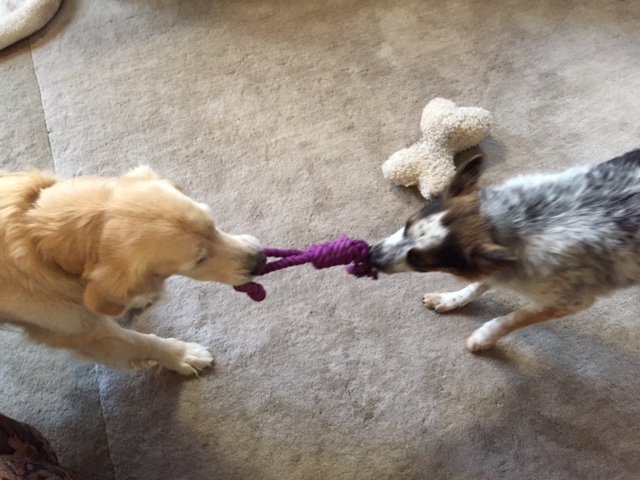 It was great fun watching Kali and Piper wrestle even if at times Kali was a reluctant participant. 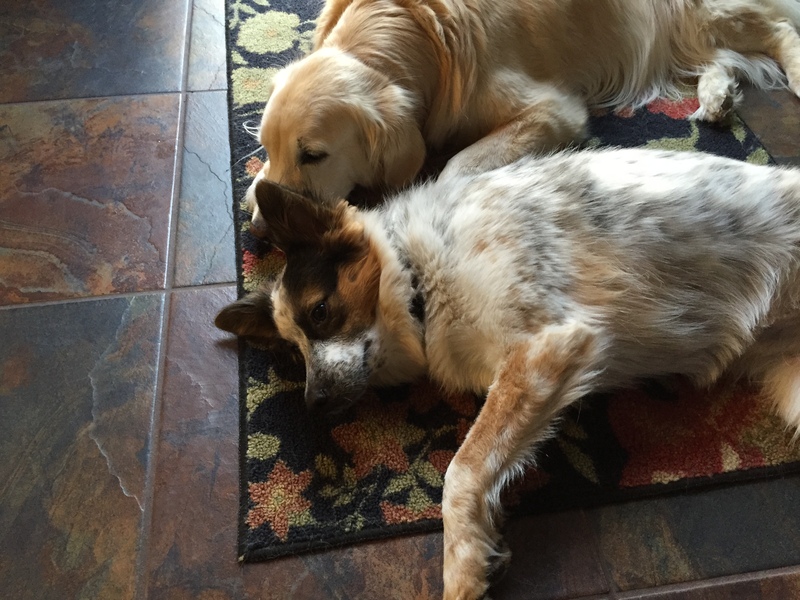 With Kali at six years old and Piper at one there is quite an energy gap especially when considering Kali’s ultra laid back temperament and Piper’s tireless demeanor typical of her Australian Shepherd breed. Piper was ready to rumble at moments notice. If Piper was like the late wrestler Rowdy Roddy Piper, then Kali was like Mohammed Ali (the greatest boxer of all time). 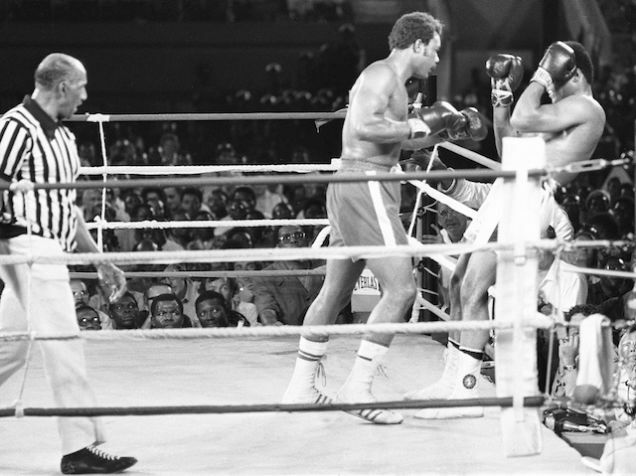 Ali would use his famous “rope-a-dope” technique designed to get his opponent to punch themselves out while he rested along the ropes and covered his face and body with his arms. Sorry for the mixed analogy of wrestling and Boxing but hopefully you get the picture. When Kali had enough she would let Piper know by using her own version of rope-a-dope leveraging her weight advantage to hold Piper down with her legs and body or let Piper run circles around her while she remained in one place watching and resting. Eventually there would be enough hair flying around the room that Holly or I would ring the figurative bell and send them to their respective corners until the next round. Which of course never began too soon for Piper. Kali, Holly, and I took an extra long walk this morning and as much as Kali seemed to enjoy having a canine companion the past two weeks she seemed to appreciate her time alone with us. It reminded me of kids having a cousin or best friend over for several days and how old toys and games seemed new again and how everything that was normal was all of a sudden special because of sharing it with someone who isn’t around too often. But then when that cousin or close friend went home it felt good to get back to “normal” and now you appreciated the routine that just a couple of weeks ago seemed boring. It was a great two weeks and of course I took a gazillion photos of Piper and Kali. Here are a few of my favorites. 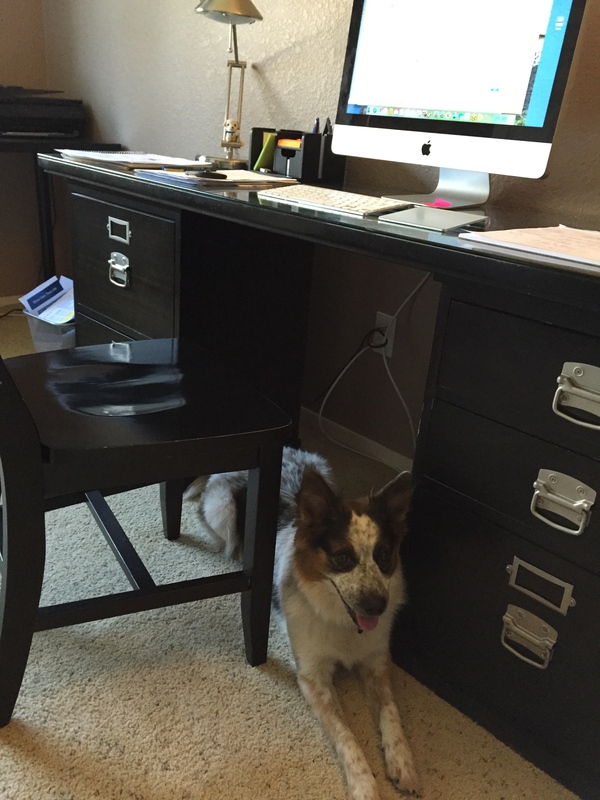 But wait there’s more… Piper is due back this afternoon because Steph and Dillip need to pick up her crate. And when Piper comes in the house I won’t be surprised to hear her say, “Hey Kali, ARE YOU READY TO RUMBLE??….”. And as pooped out as Kali may be I’m pretty sure she’ll be ready to answer the bell.